Mitochondrial complex IV deficiency (also known as cytochrome c oxidase – COX – deficiency or simply complex IV deficiency) is a very rare genetic metabolic disorder. Complex IV – also called cytochrome c oxidase – is the terminal enzyme of the respiratory chain and consists of 14 subunits, 3 of which (named COX1, COX2 and COX3) are encoded by mitochondrial DNA. Pathogenic mutations causing COX deficiency are mostly seen in nuclear DNA encoded genes and are associated with autosomal recessive transmission (APOPT1, C12ORF62, COA3, COA5, COA6, COX10, COX14, COX15, COX20, COX6B1, FARS2 FASTKD2, LRPPRC, PET100, POLG, SCO1, SCO2, SURF1, TACO1). Rarely COX deficiency may be caused by a mutation in a mitochondrial DNA gene, showing maternal inheritance (MTCO1, MTCO2, MTCO3, MTTL1, MTTS1). The condition predominantly affect the skeletal muscles, but maybe generalized and therefore impact also heart, brain, kidney, connective tissue and liver. COX deficiency may be found as isolated (when caused by mutations in any of the above genes) or as part of a chromosomal disorder (when caused by large deletions involving also adjacent genes – see for instance the homozygous deletion of chromosome 19q13.11 – van Bon et al. 2013). The benign variant of the infantile form is mainly characterized by generalized weakness of skeletal muscles (myotonia), but no other tissues/organs are involved. In the severe form, the disorder is characterized by a generalized weakness of skeletal muscles, abnormalities of the heart and kidneys, and/or lactic acidosis. De Toni-Fanconi-Debre syndrome (a renal syndrome caused by transport defects of amino acids, monosaccharides, sodium, potassium, phosphorus, calcium, bicarbonate, uric acid, and proteins in the proximal renal tubule) may also be present and may include excessive thirst and urination. The main feature of cardioencephalomyopathy due to cytochrome c oxidase deficiency [CEMCOX] is cardiomyopathy, which can arise either in utero or in the first days of life. The following neurological stigmata are also frequently seen: abnormal breathing, nystagmus and gyral abnormalities. The disorder is usually fatal in early infancy. Those with mutations in the SCO2 gene, tend to have a more severe disease. Leigh disease is a generalized clinical syndrome characterized by progressive degeneration of brain, heart, kidneys, muscles, and liver. Motor skills regression, generalized weakness with hypotonia, irritability, vomiting, seizures and lactic acidosis are typical. Onset is in infancy or early childhood with encephalopathy and failure to thrive (usually between three months and two years of age). 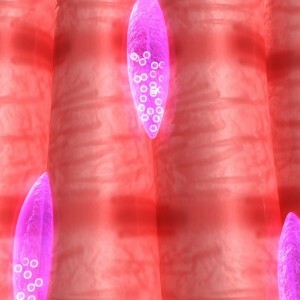 Children with earlier disease onset, especially those with mutations in the SURF1, tend to have a more severe disease. More than half of the patients die in childhood, often within the first 18 months of life. French Canadian type of Leigh syndrome is an early-onset progressive neurodegenerative disorder with delayed psychomotor development and mental retardation, dysmorphic facial features, hypotonia, and ataxia. MRI shows lesions in the brainstem and basal ganglia. Metabolic and/or neurologic crises may often lead to early death. Strabismus may be seen in patients with COX deficiency associated with Leigh syndrome, French-Canadian type. In some rare cases, symptoms of COX deficiency may not develop until adolescence or adulthood. The adult form is characterized by generalized muscle aches, hypotonia and occasional twitching and stiffness of the musculature. These patients may have history of diabetes, acute hearing loss, hyperlipidemia, hyperuricemia, arterial hypertension, polyarthrosis, hypogonadism, and hypothyroidism. Weakness, myalgias, CK elevation and diabetes may be present in the family history. Clinical investigations may show postural tremor, reduced tendon reflexes, and elevated serum CK levels. Muscle biopsy is aspecific, but the biochemistry of the muscle homogenate may reveal an isolated complex IV defect and reduced amounts of coenzyme Q (CoQ). In patients with the adult form, coenzyme Q supplementation, low-carbohydrate diet, and gluten-free diet may have a beneficial effect at least on some of the manifestations. COX deficiency should be suspected in all infants with evocative clinical presentation and episodes of lactic acidosis. Reduced activity of cytochrome C oxidase may be confirmed in fibroblasts from connective tissue biopsy. Muscle biopsy studies may reveal “ragged-red fibers”. By special staining techniques, available in selected laboratories, it is possible to see which subunits of the COX enzyme are affected. Genetic testing by whole exome sequencing may reveal pathogenic mutations in a known gene or detect possibly disease-causing mutations in as-yet-unknown candidate genes. Posted in Academia, Disease cards, Last Update, Medical Genetics and tagged APOPT1, C12ORF62, COA3, COA5, COA6, COX10, COX14, COX15, COX20, COX6B1, cytochrome c oxidase deficiency, FARS2 FASTKD2, FASTKD2, LRPPRC, Mitochondrial complex IV deficiency, MTCO1, MTCO2, MTCO3, MTTL1, MTTS1, PET100, POLG, SCO1, SCO2, SURF1, TACO1.